Preheat oven to 375. Lightly grease or spray casserole dish. In a medium saucepan, heat oil. Add onion, shallot and garlic, cook until translucent, about 5-10 minutes, stirring occasionally. Add spinach, tomatoes and oregano. Stir occasionally, breaking up tomatoes with a spoon. Cook about 10 minutes or until cooked through. Pour over drained macaroni. Place in alternating layers in the casserole, beginning and ending with cheese. Cook 20-30 minutes or until bubbly hot. I have really been in the mood for some retro style comfort food. It was pretty fast to make and certainly easy. I bet you could make and refrigerate this the day before baking and it would be just as good although it would take longer to bake. 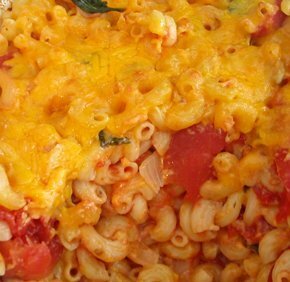 It's actually a fairly healthy version of mac and cheese compared to a lot of recipes that call for butter and milk/cream along with all of the cheese. The tomatoes, celery and spinach give you more than a serving of vegetables and if you use low fat cheddar, it is almost light.